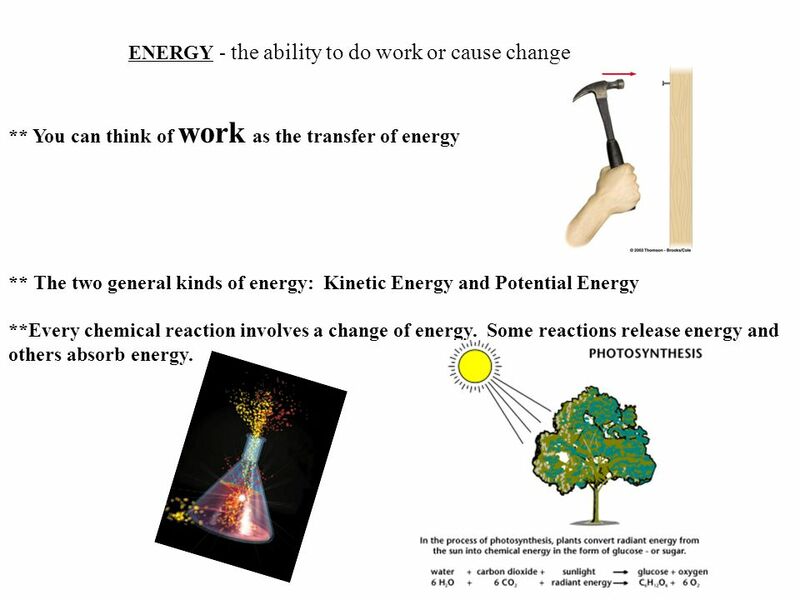 ** You can think of work as the transfer of energy ** The two general kinds of energy: Kinetic Energy and Potential Energy **Every chemical reaction involves a change of energy. Some reactions release energy and others absorb energy. 4 Mechanical Energy - the energy associated with the motion or position of an object. This type can occur as kinetic or potential. 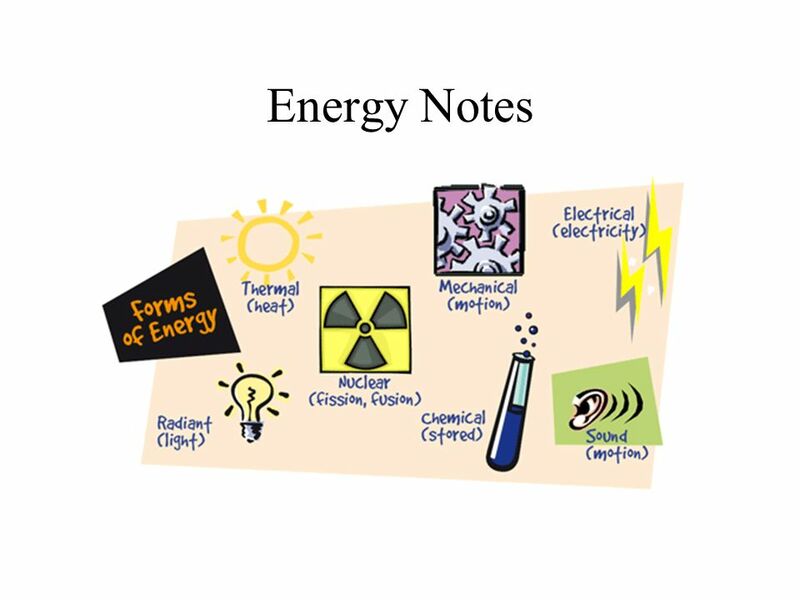 Thermal Energy - the total energy of the particles in a substance or material. 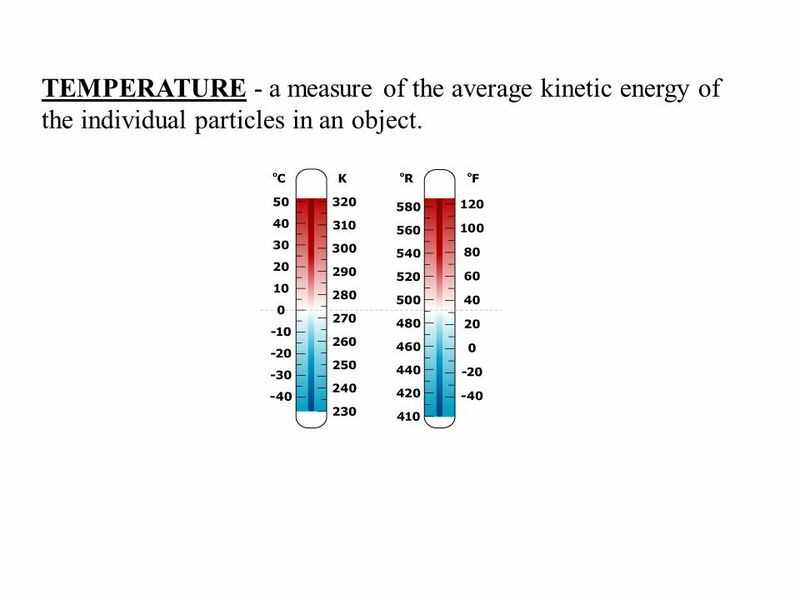 When the thermal energy of an object increases, its particles move faster, making the temperature of the object rise. These particles have both potential energy and kinetic energy. 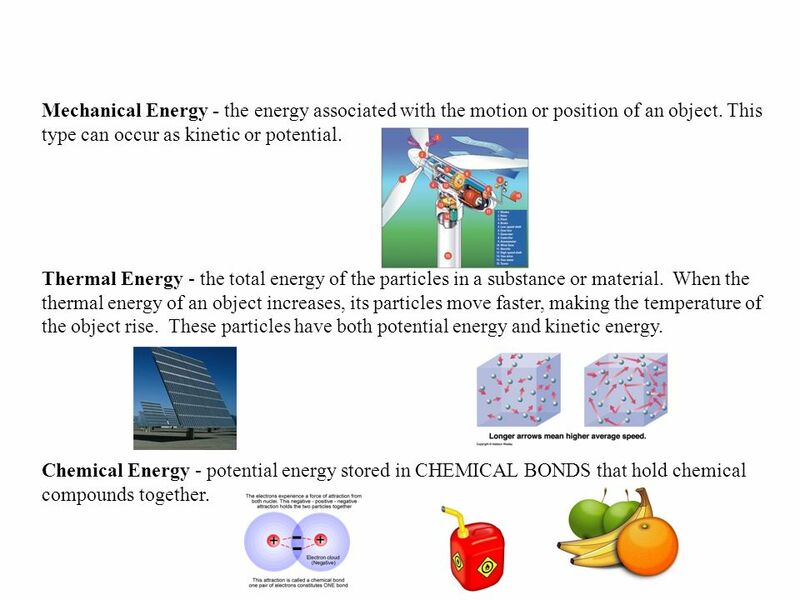 Chemical Energy - potential energy stored in chemical bonds that hold chemical compounds together. 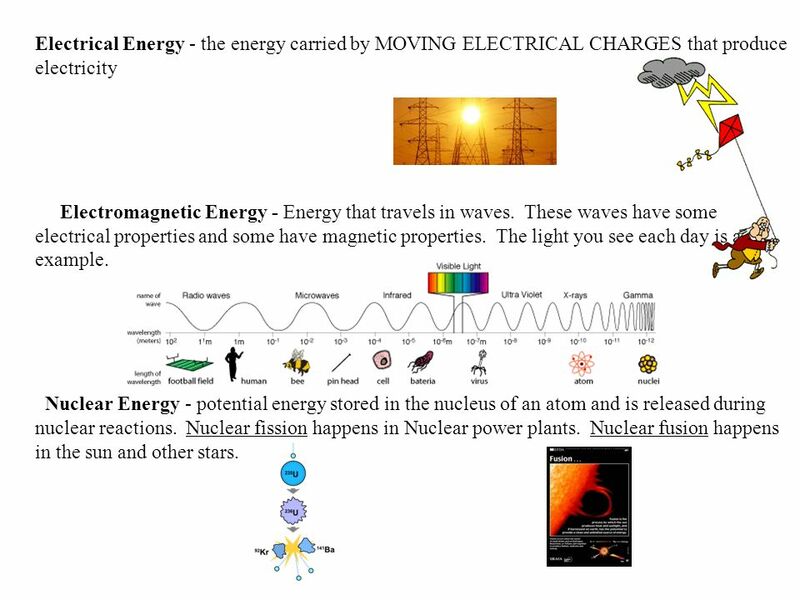 Electromagnetic Energy - Energy that travels in waves. These waves have some electrical properties and some have magnetic properties. The light you see each day is an example. Nuclear Energy - potential energy stored in the nucleus of an atom and is released during nuclear reactions. Nuclear fission happens in Nuclear power plants. Nuclear fusion happens in the sun and other stars. 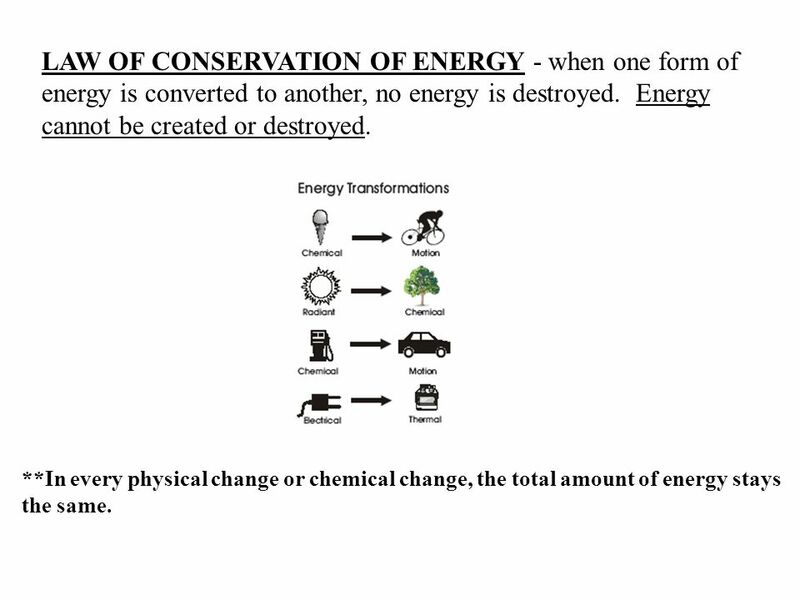 7 LAW OF CONSERVATION OF ENERGY - when one form of energy is converted to another, no energy is destroyed. Energy cannot be created or destroyed. **In every physical change or chemical change, the total amount of energy stays the same. 8 TEMPERATURE - a measure of the average kinetic energy of the individual particles in an object. 10 without the movement of matter itself. 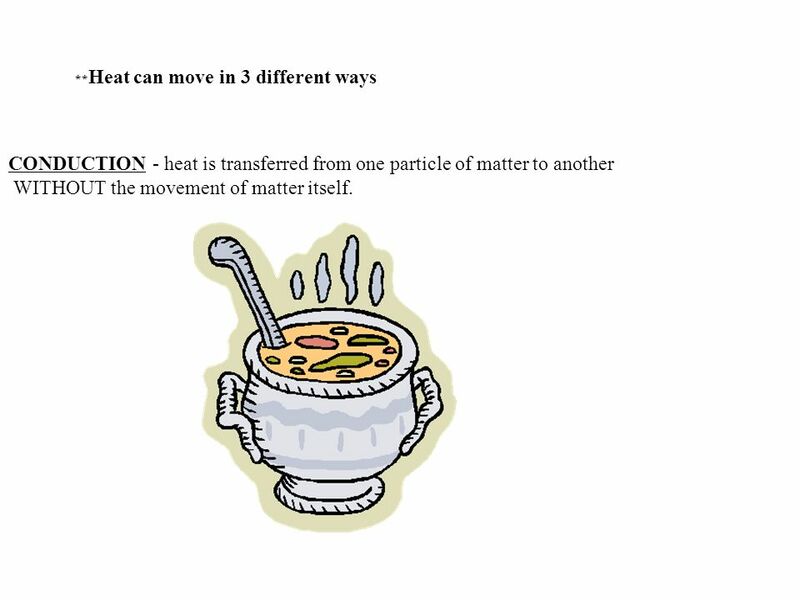 **Heat can move in 3 different ways CONDUCTION - heat is transferred from one particle of matter to another without the movement of matter itself. 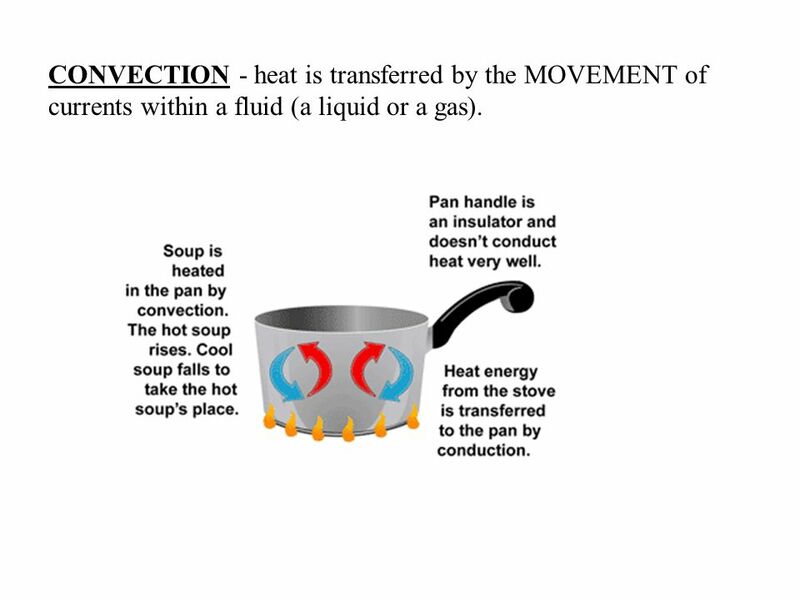 11 CONVECTION - heat is transferred by the movement of currents within a fluid (a liquid or a gas). RADIATION - the transfer of energy by electromagnetic waves. 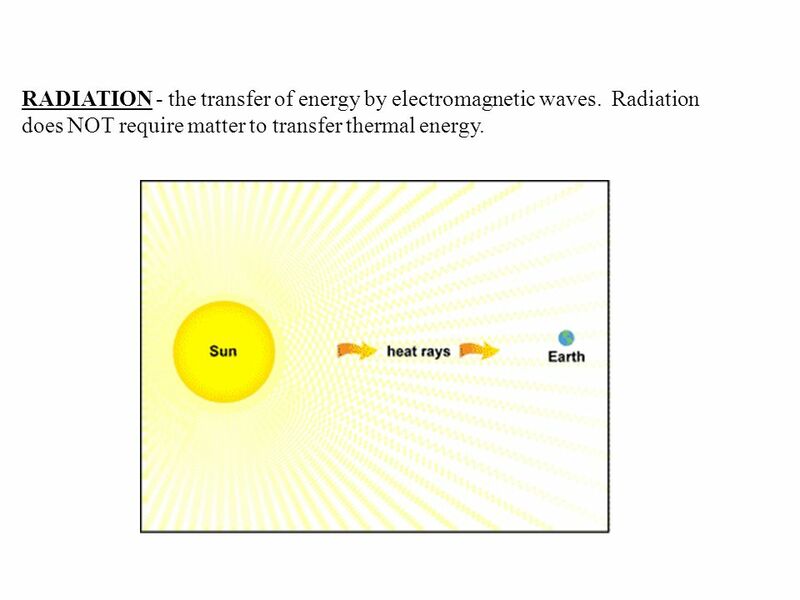 Radiation does not require matter to transfer thermal energy. 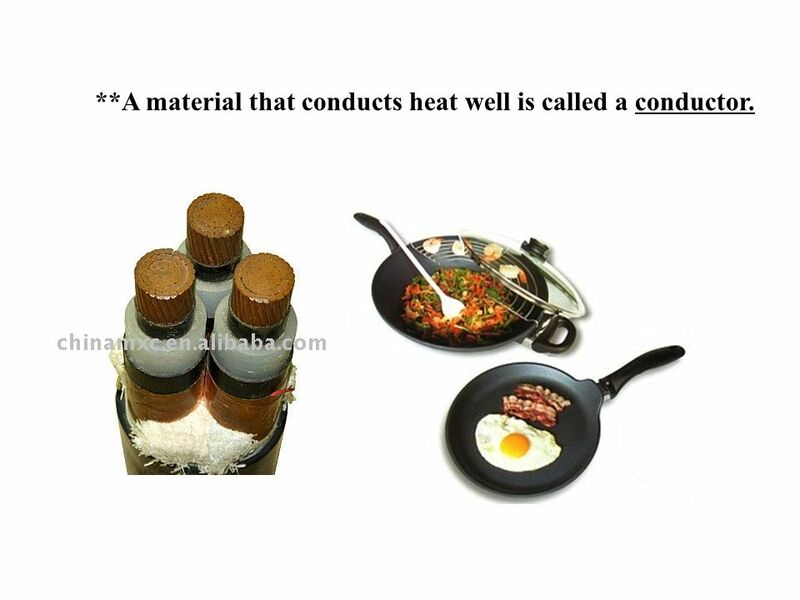 13 **A material that conducts heat well is called a conductor. 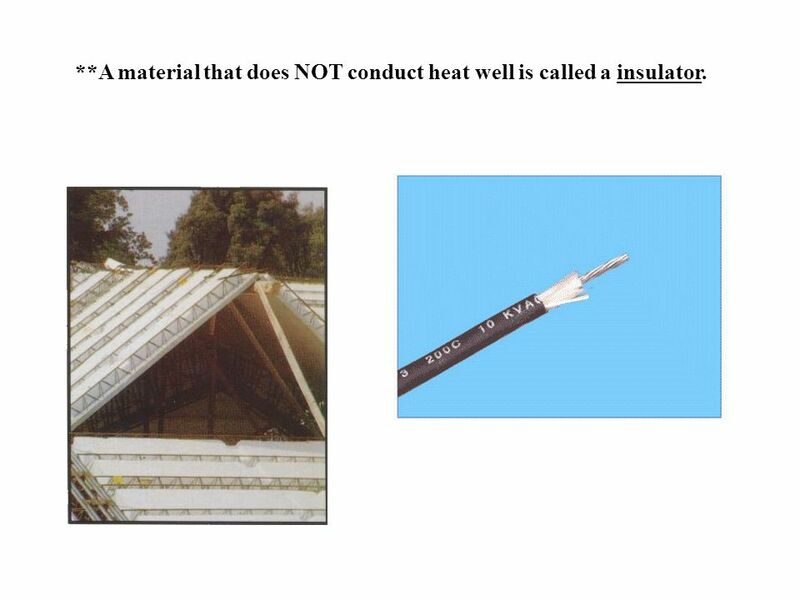 14 **A material that does not conduct heat well is called a insulator. Energy The ability to cause a change. Energy! The ability to do work. What is Energy? Ch. 5---Section 1. 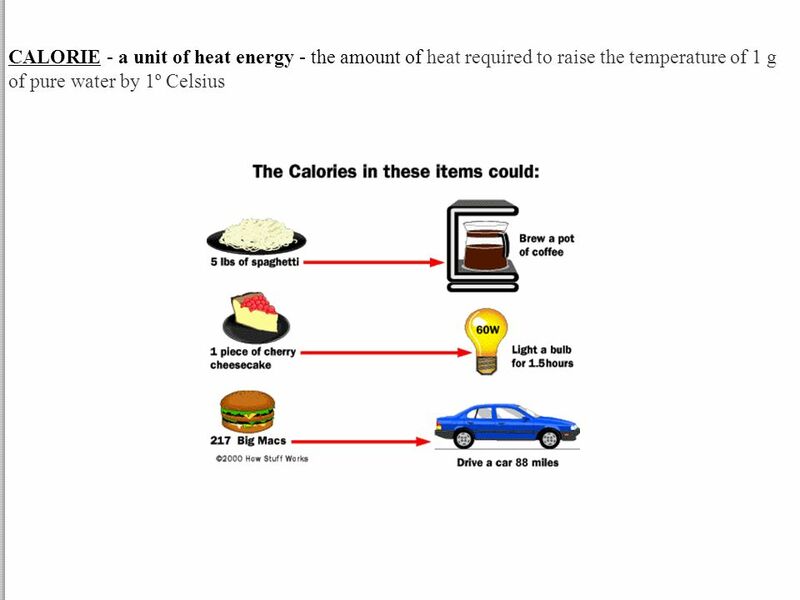 6.P.3.1 Illustrate the transfer of heat energy from warmer objects to cooler ones using examples of conduction, radiation and. Six Forms of Energy. 1.Mechanical Energy: energy due to an object’s motion or position. Examples: moving object, stationary (still) object.  1. Energy is the ability to do work or cause change.  2. You measure energy in joules.  3. 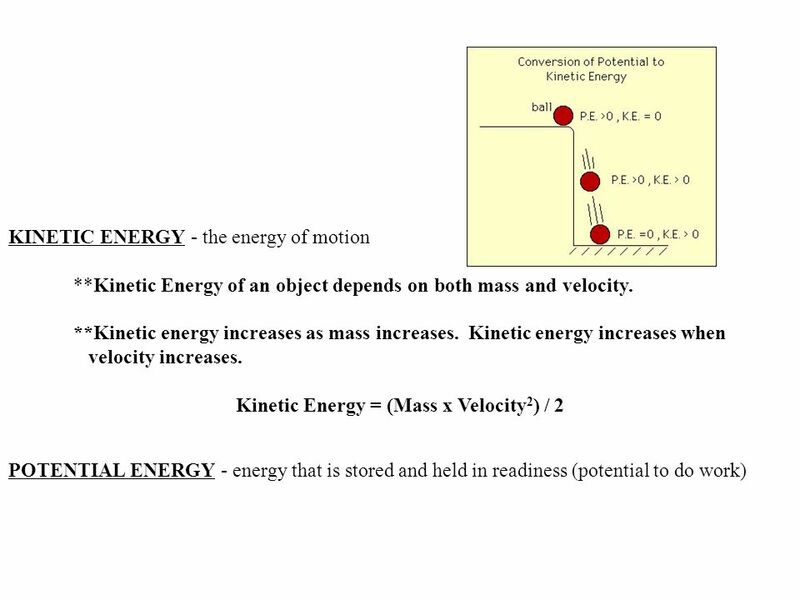 2 main type of energy is kinetic and potential.  4. Heat and Energy Energy is the ability to do work. Work is done when a force causes an object to move in the direction of the force. Work is a transfer. Energy What is energy? Energy is the ability to do work. What is Energy  Energy is the ability to cause change. Change in ANYTHING  There are two general types of energy Kinetic energy Potential energy. 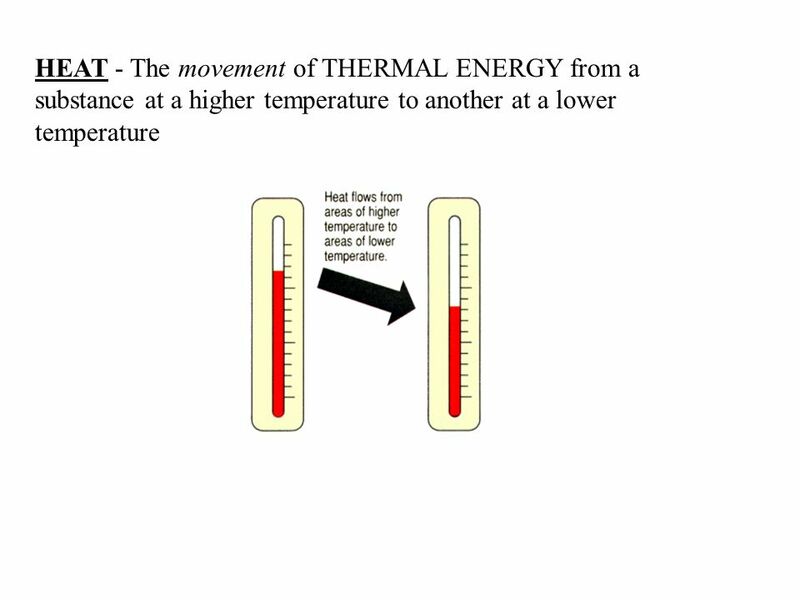 Thermal energy and Heat. Thermal energy Thermal energy is the total kinetic energy of all particles in a substance Measured in joules (J) This is not. Energy The ability to do work or cause changes in matter. Energy and Power The Nature of Energy. What is energy? The ability to work or cause change is called energy. When an object or organism does work on another. Energy. Energy is the ability to do work – Work is a transfer of energy Energy is measured in joules (J) – 1 joule = work done to move an object 1 meter.